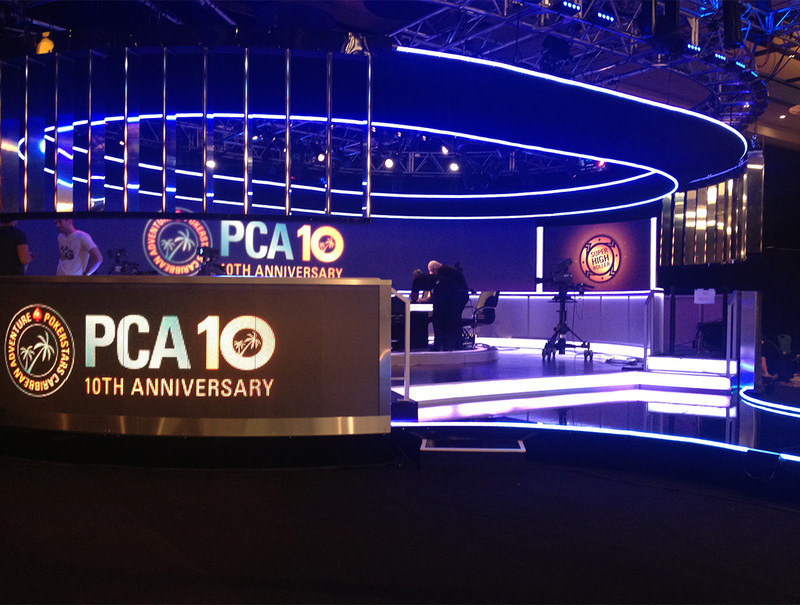 Pokerstars.com chose Anna Valley’s LED displays, for the 2013 Pokerstars Caribbean Adventure (PCA) in The Bahamas. The event was steamed live throughout the world from the Atlantis Paradise Island Resort, Nassau. Production Designer, Andrew Gates, produced an attractive and practical TV show style of set, within the enormous function suites inside the giant Atlantis Hotel. This featured a concave curved backdrop screen in Duo12, 12mm LED, flanked at each end with curved Toshiba 6mm screens. Additional Duo12 displays were set in a custom built convex curve facing outwards and MiSTRIP was added for extra decorative effect. All of the LED displays were supplied with custom video graphics. Andrew added a screen diffuser material to the 12mm LED to aid photography and on-camera close-ups. The end result was extremely successful. We even managed to persuade our AV crews to leave dear old England in January for a two-week spell in Nassau. Indeed, no shortage of volunteers on this one.